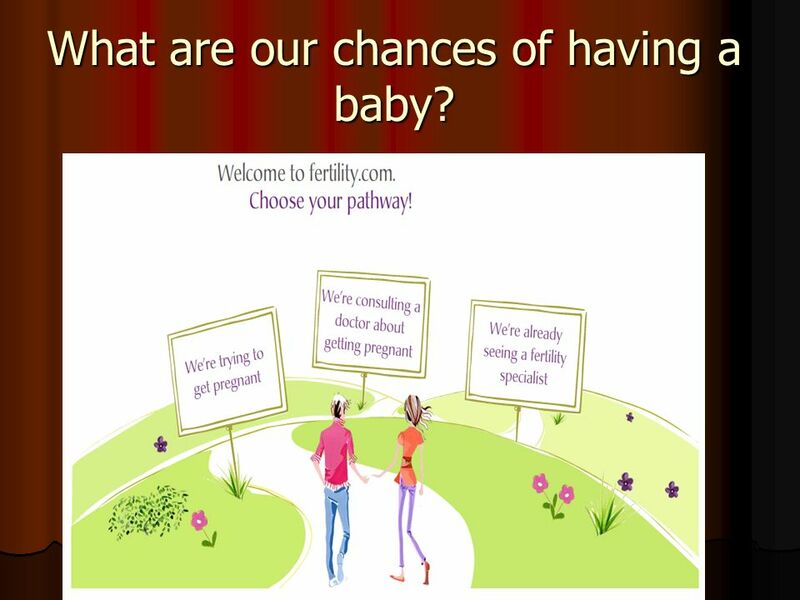 3 What are our chances of having a baby? 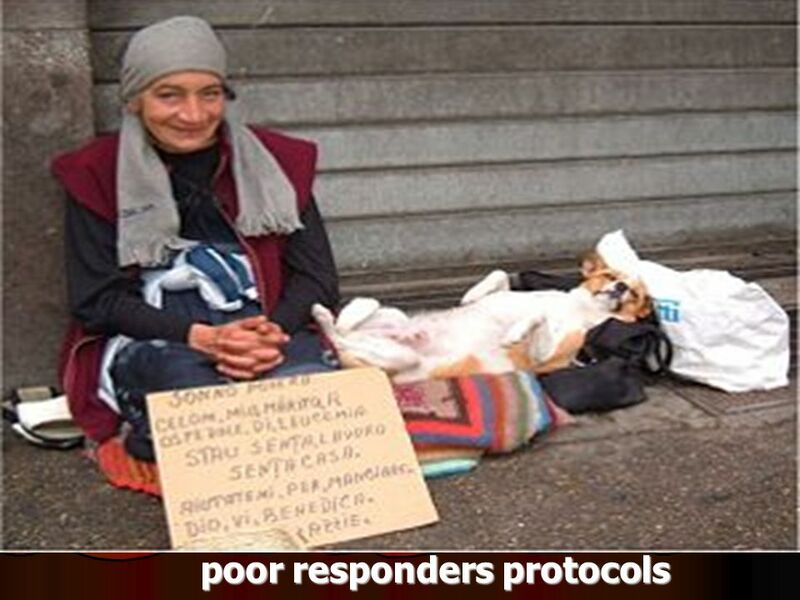 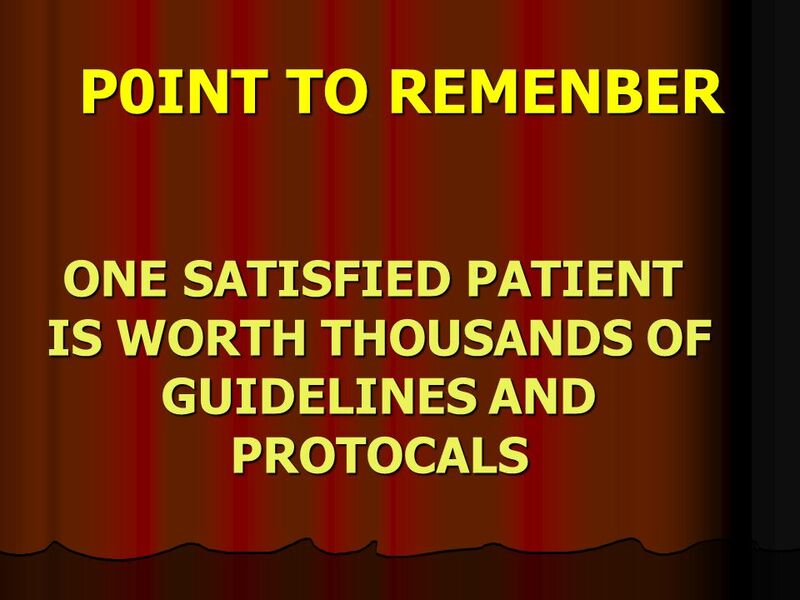 5 There is no golden standards, guidelines or protocol. 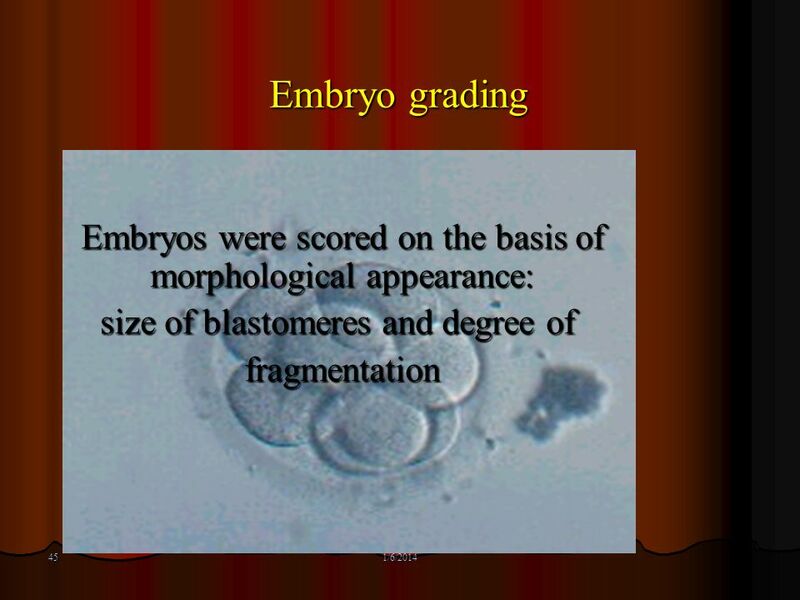 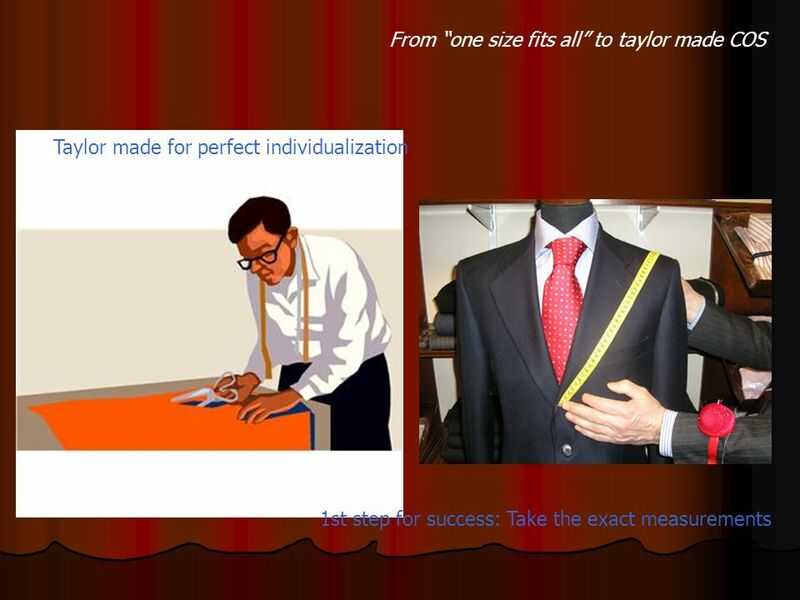 Any of the following slides is packed up with hundreds of reputed studies. 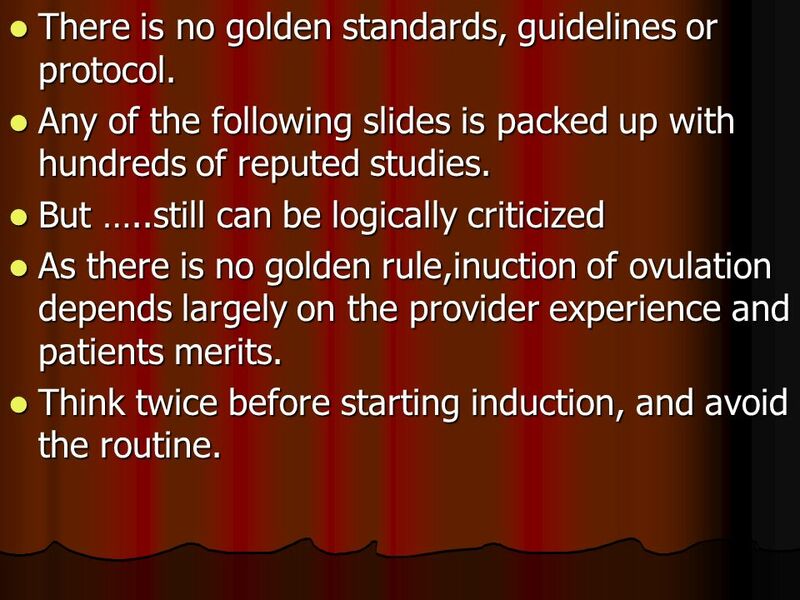 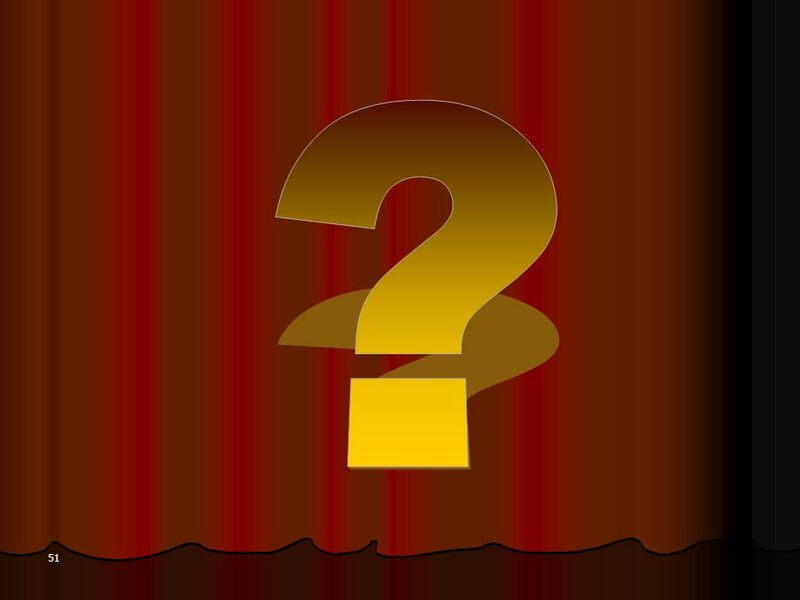 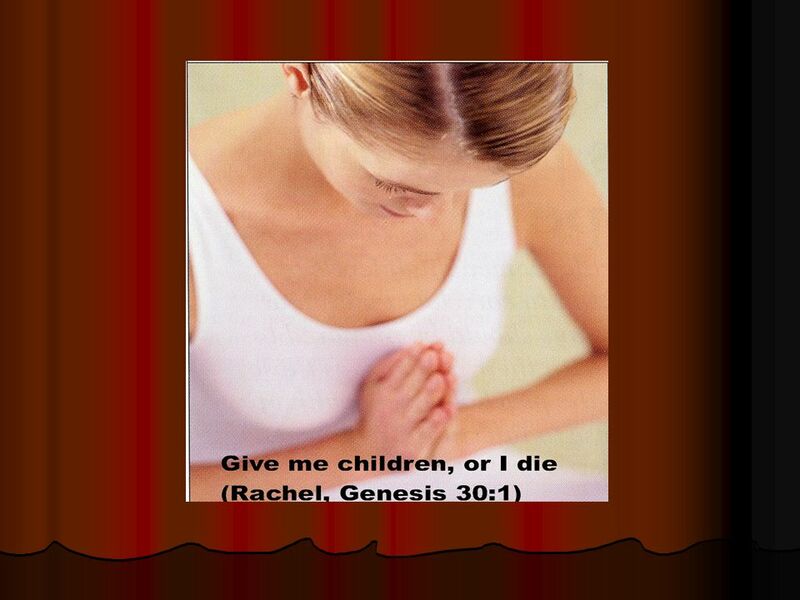 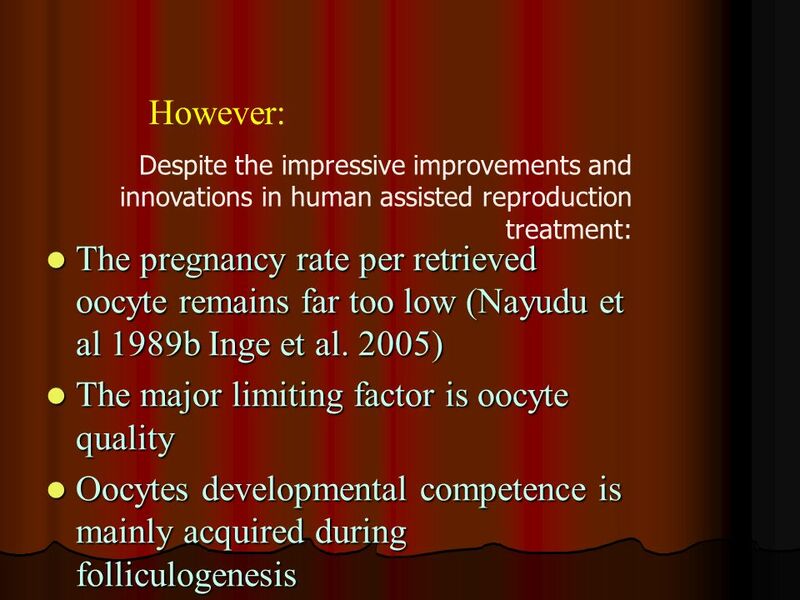 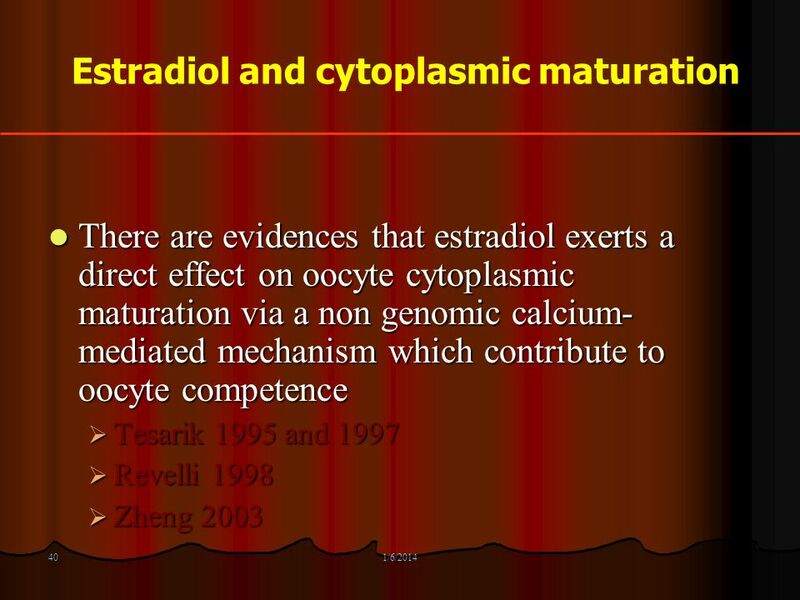 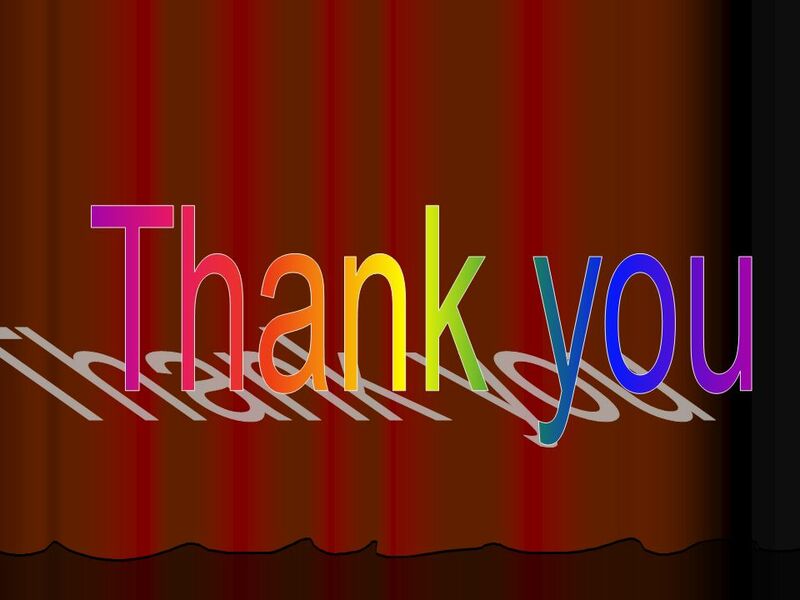 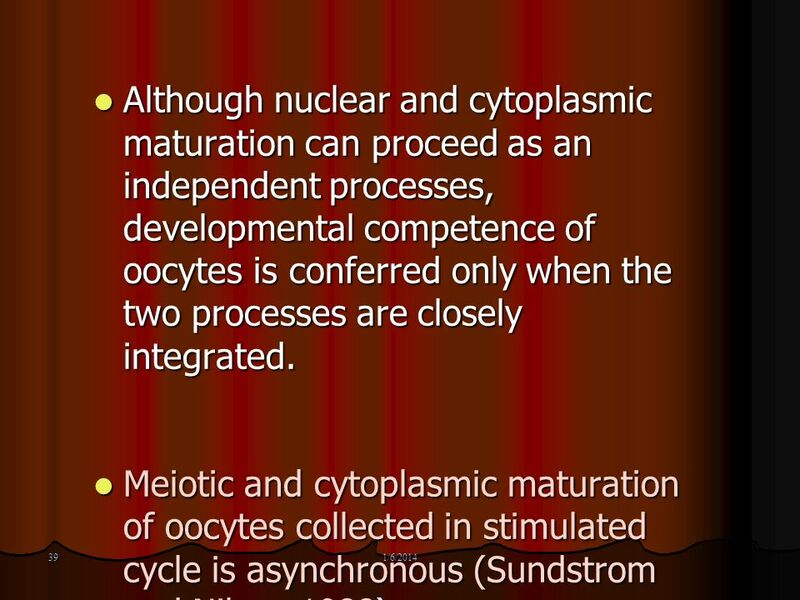 But …..still can be logically criticized As there is no golden rule,inuction of ovulation depends largely on the provider experience and patients merits. 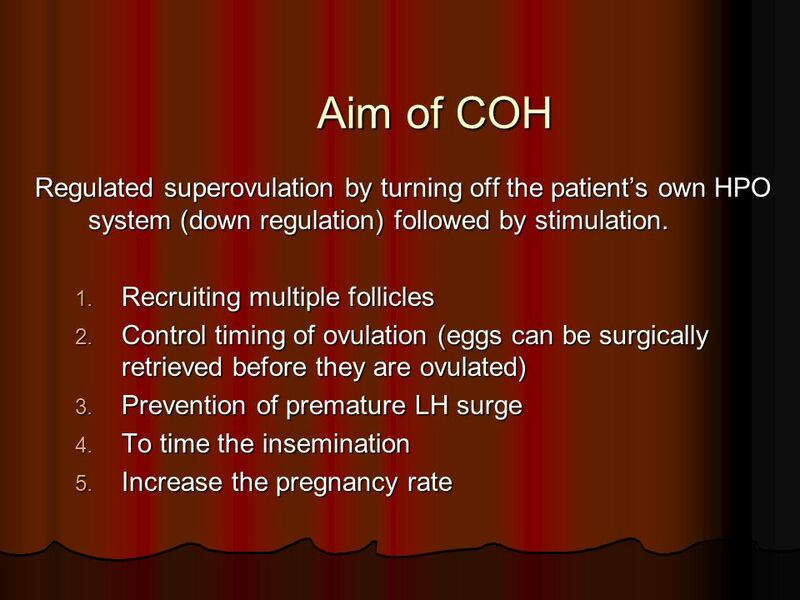 Think twice before starting induction, and avoid the routine. 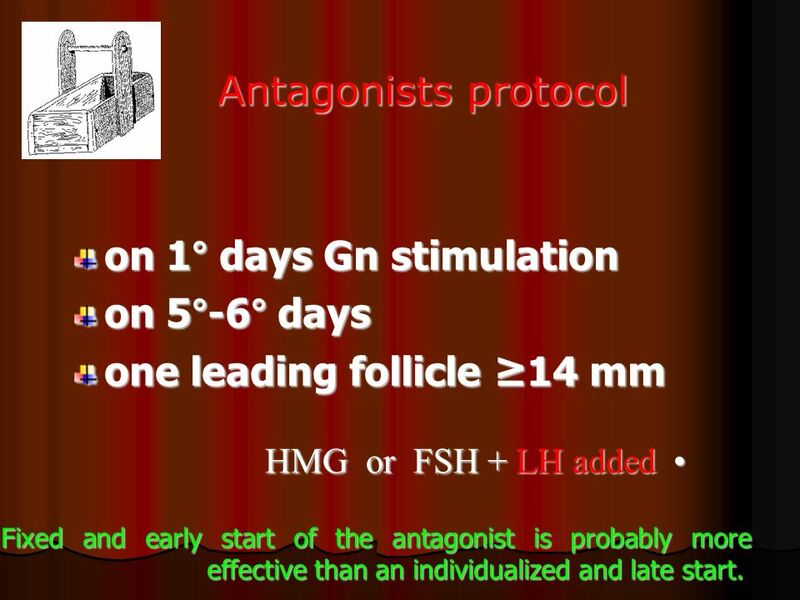 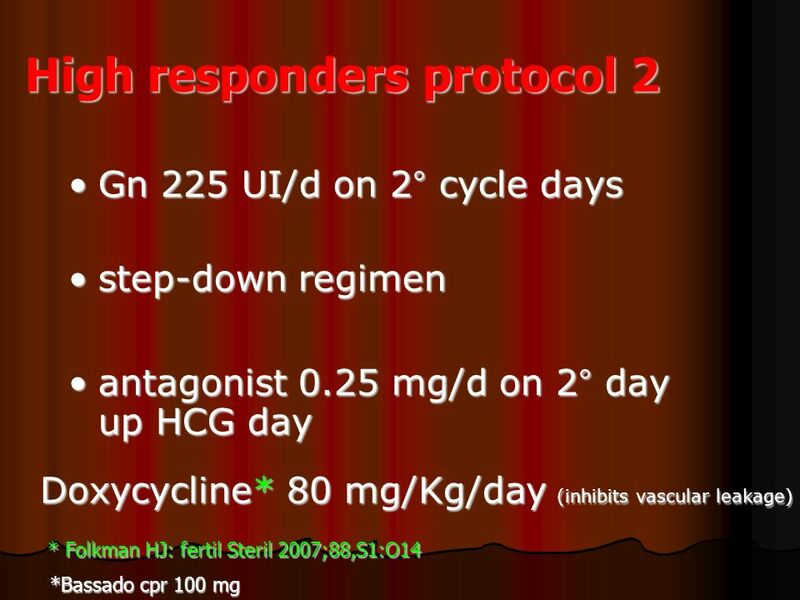 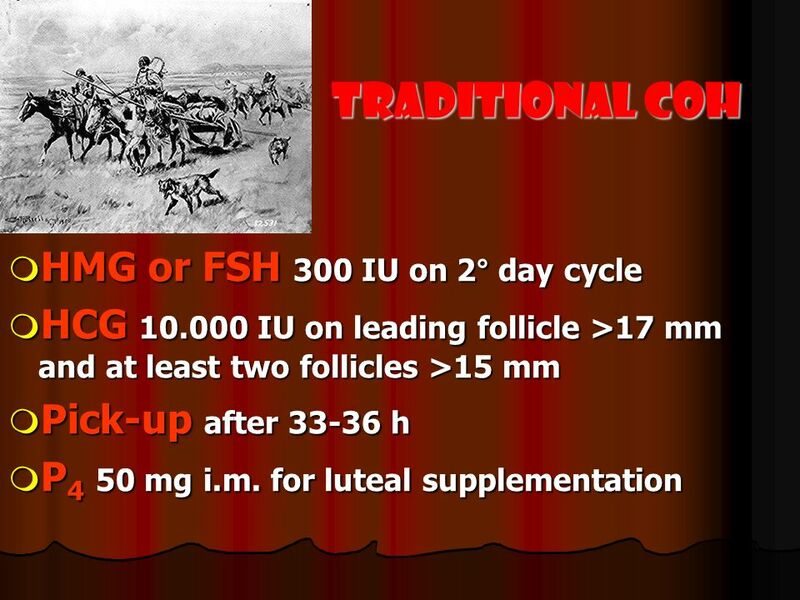 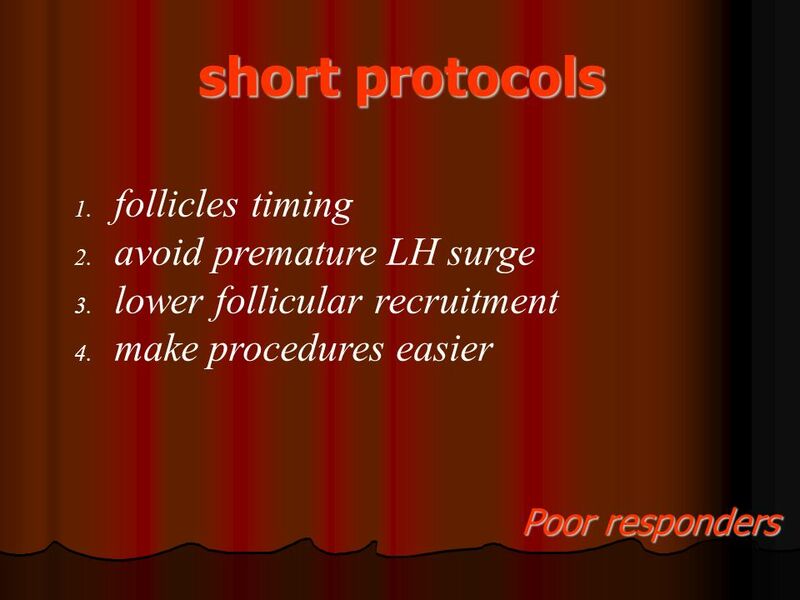 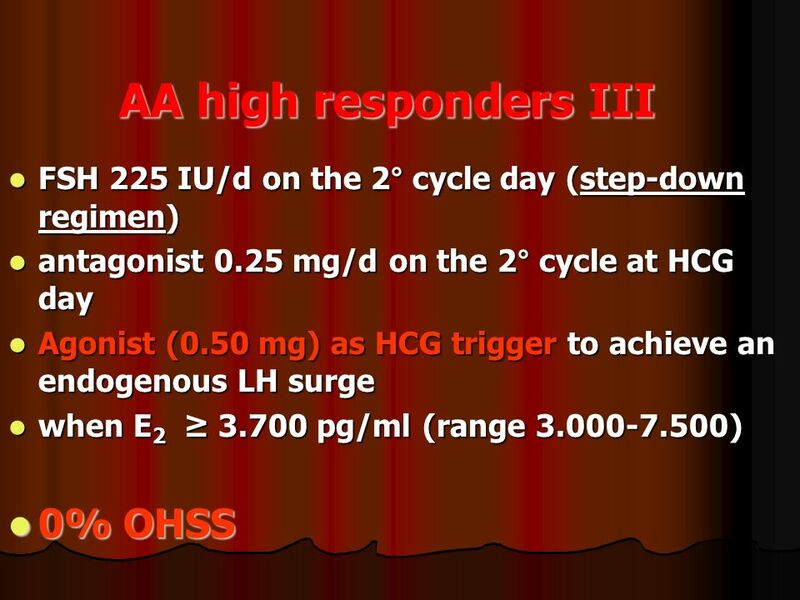 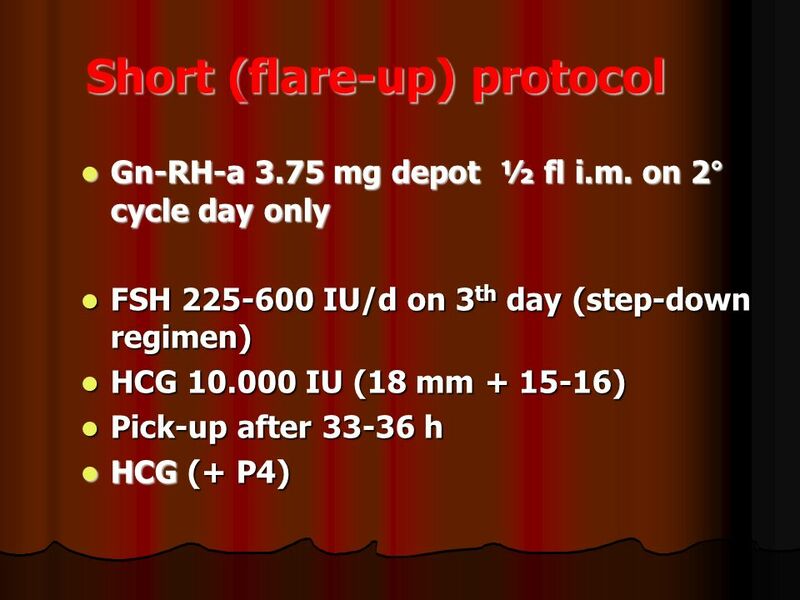 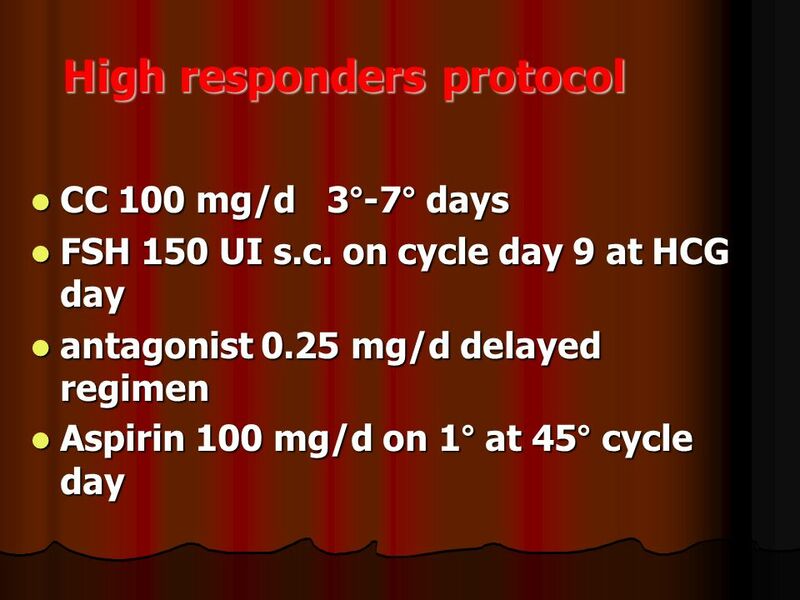 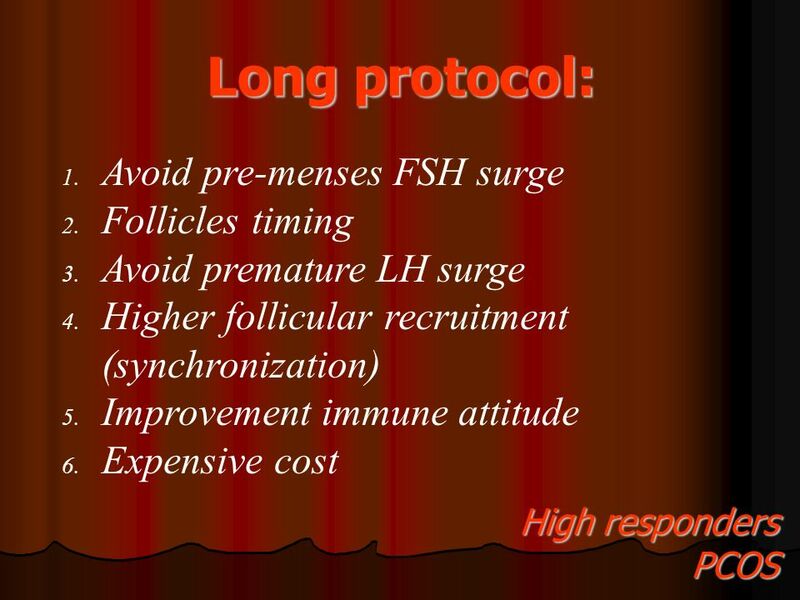 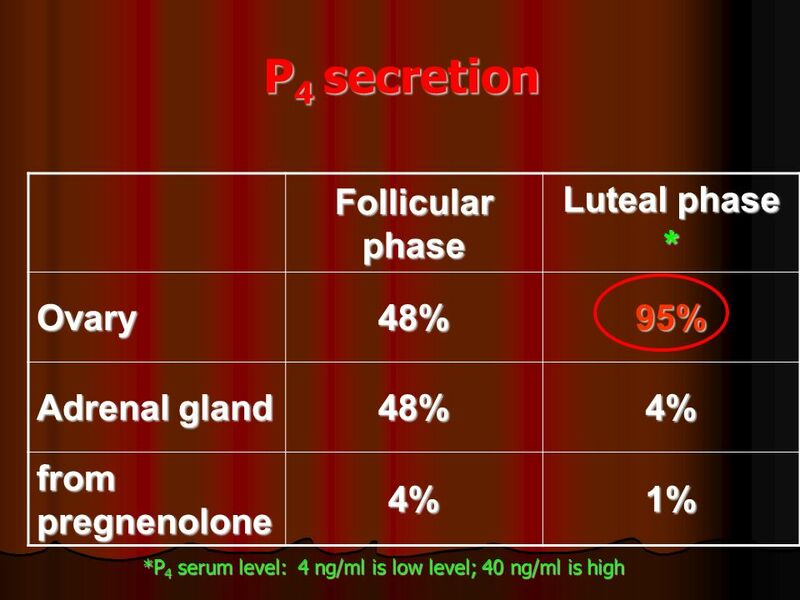 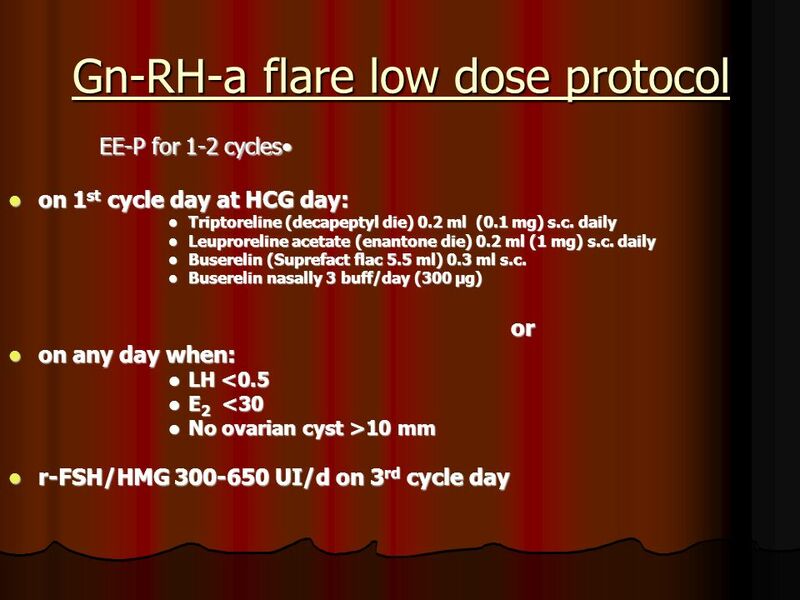 Antagonists protocol on 1° days Gn stimulation on 5°-6° days one leading follicle ≥14 mm HMG or FSH + LH added Fixed and early start of the antagonist is probably more effective than an individualized and late start. 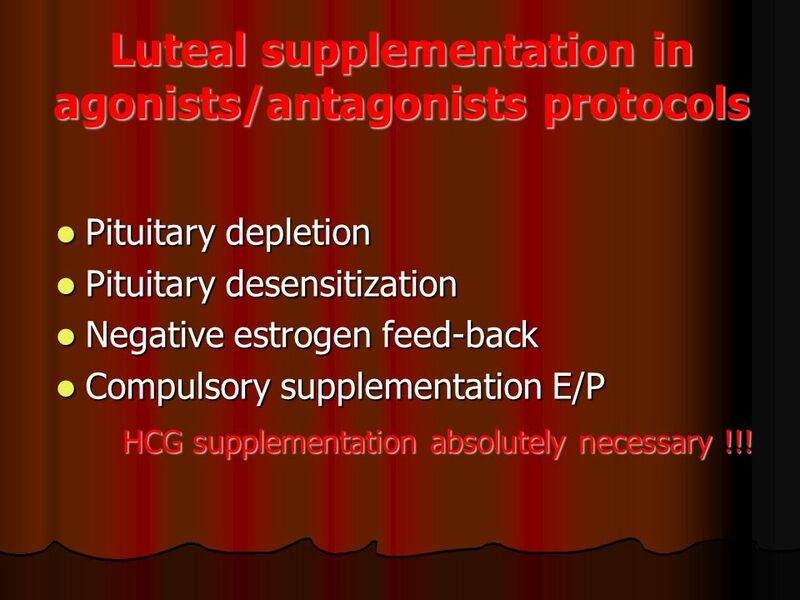 Pituitary depletion Pituitary desensitization Negative estrogen feed-back Compulsory supplementation E/P HCG supplementation absolutely necessary !!! 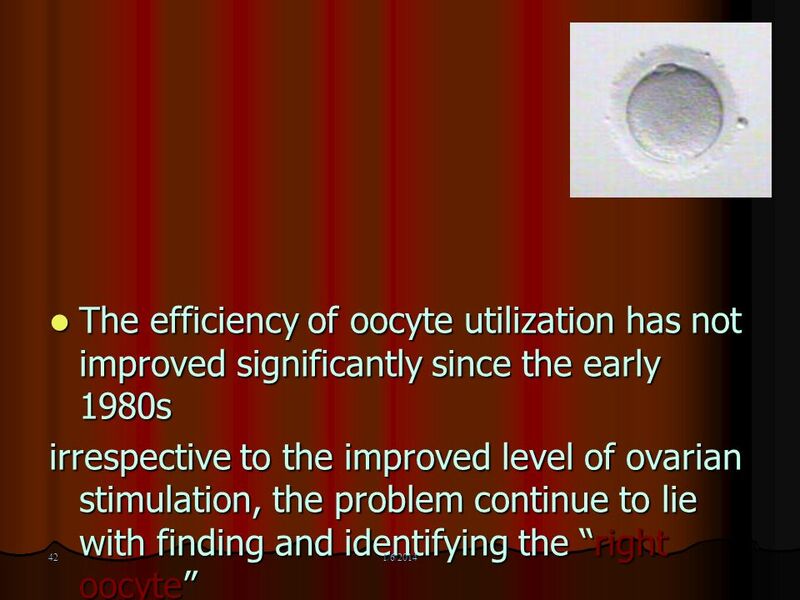 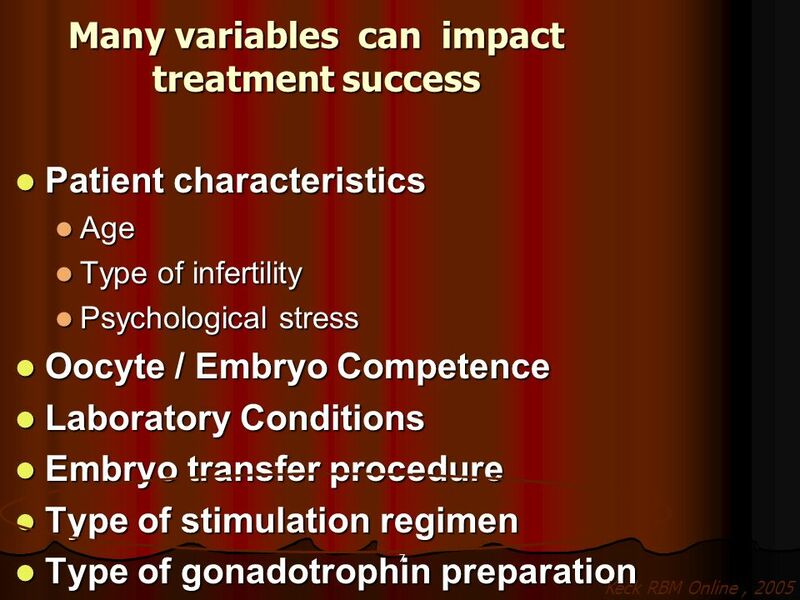 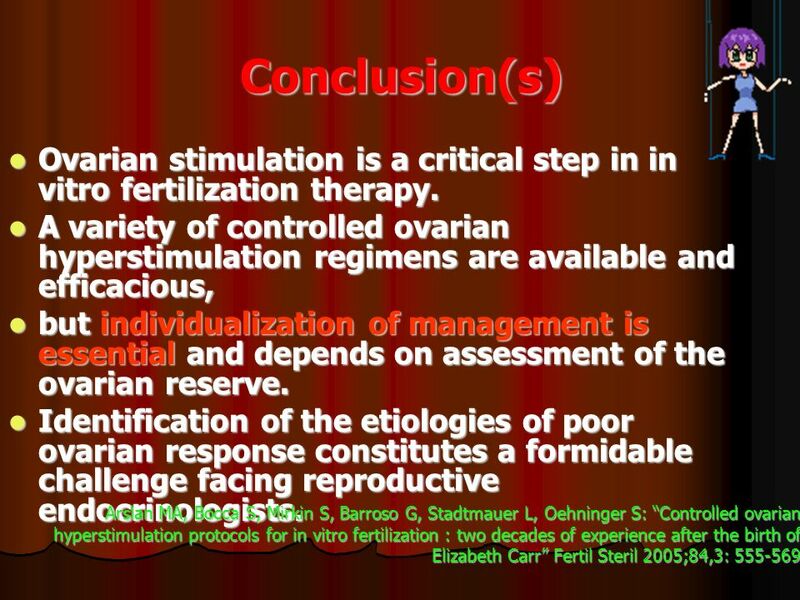 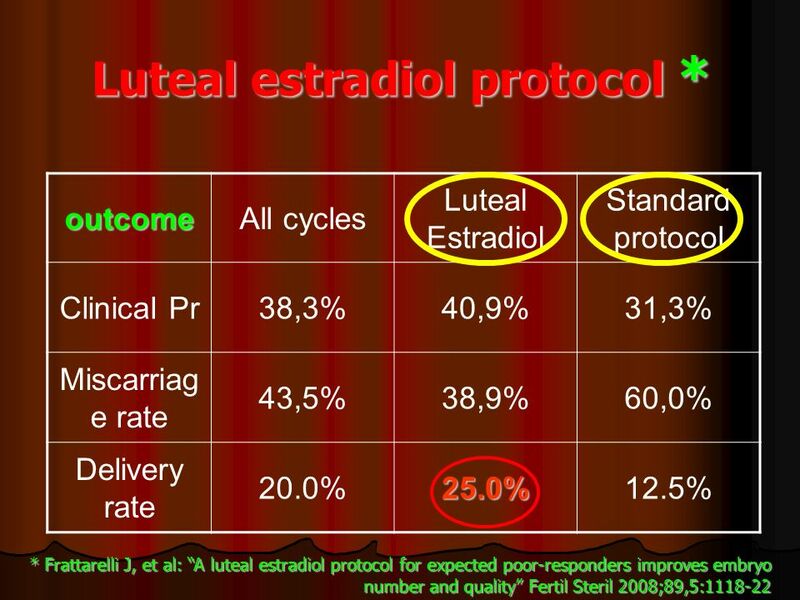 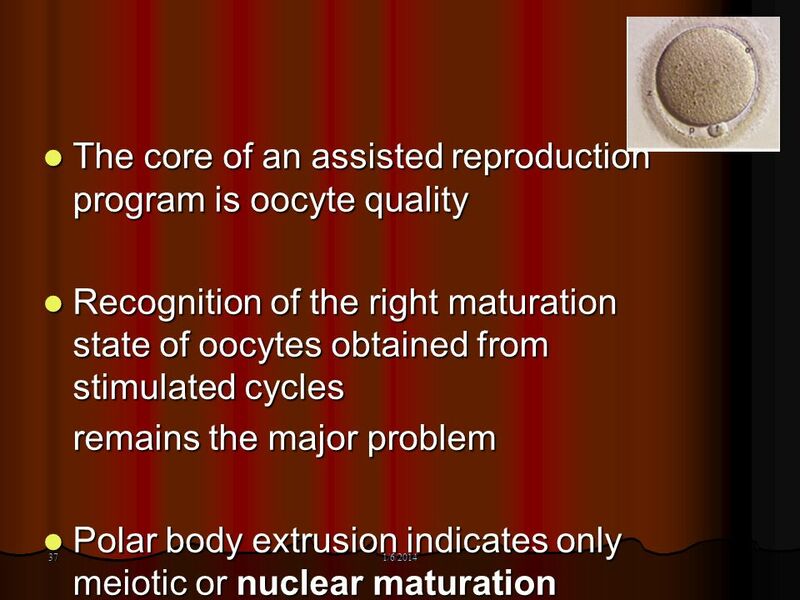 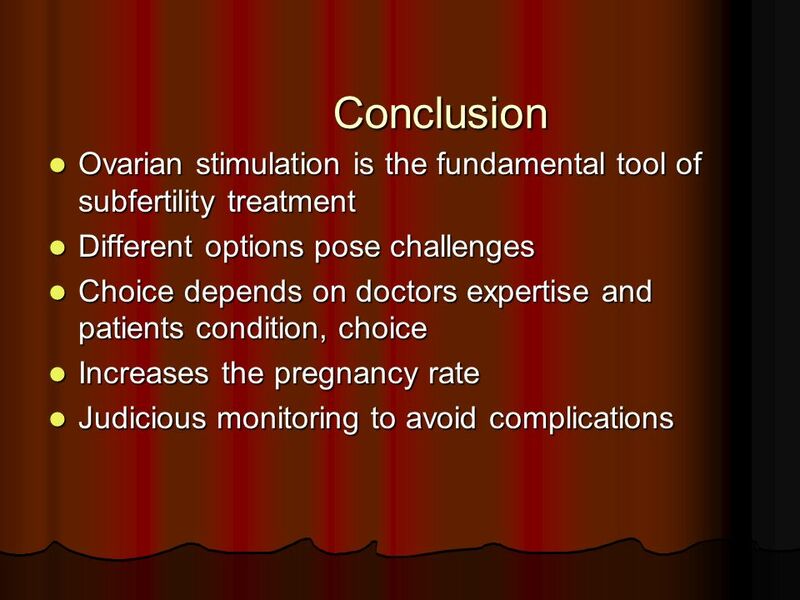 Download ppt "Ovulation induction TAQI Consultant OB/GYN,Infertility,IVF"
ALTERNATE DAY TRIPTORELIN: A COST EFFECTIVE METHOD FOR CONTROLLED OVARIAN HYPERSTIMULATION E. Karatekeli, H. Özörnek, E. Ergin, B. Ongun EUROFERTIL REPRODUCTIVE. 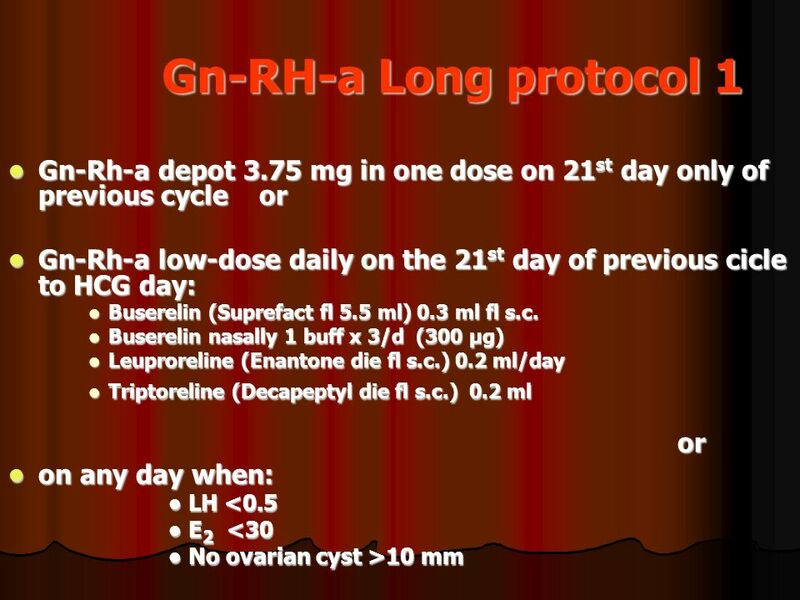 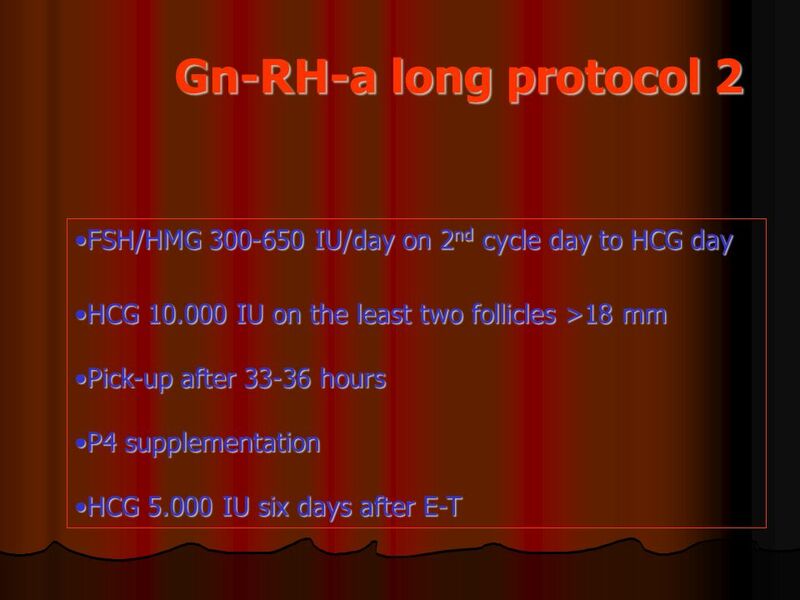 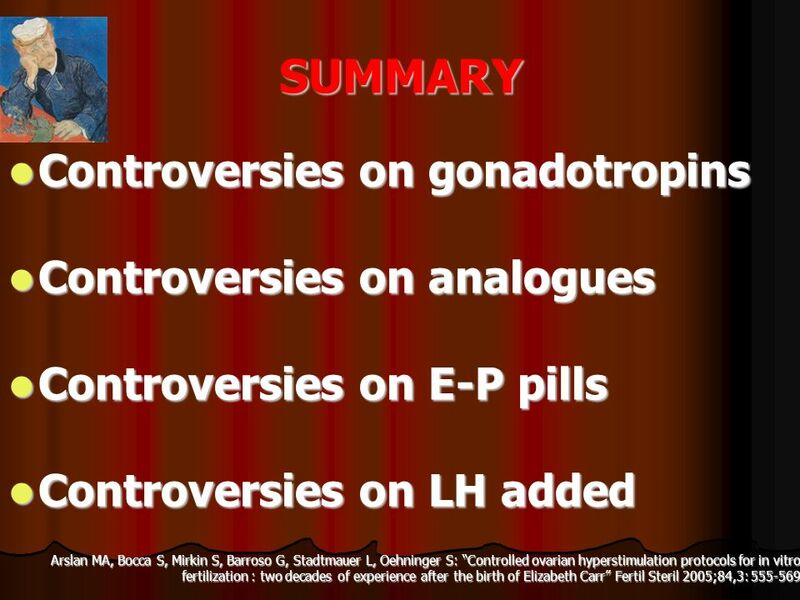 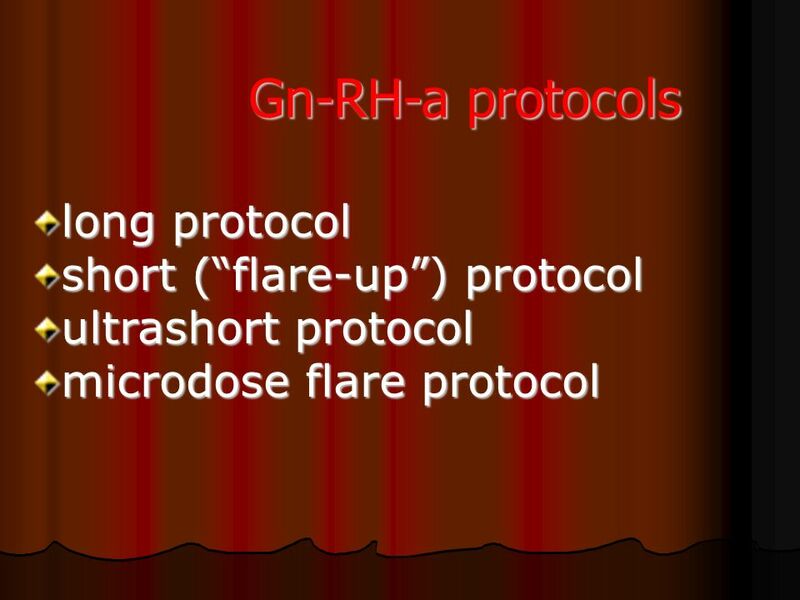 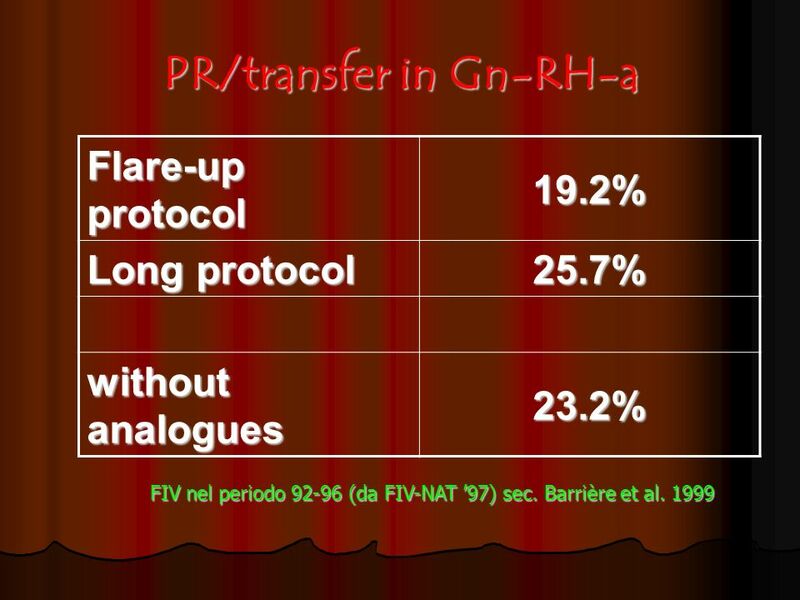 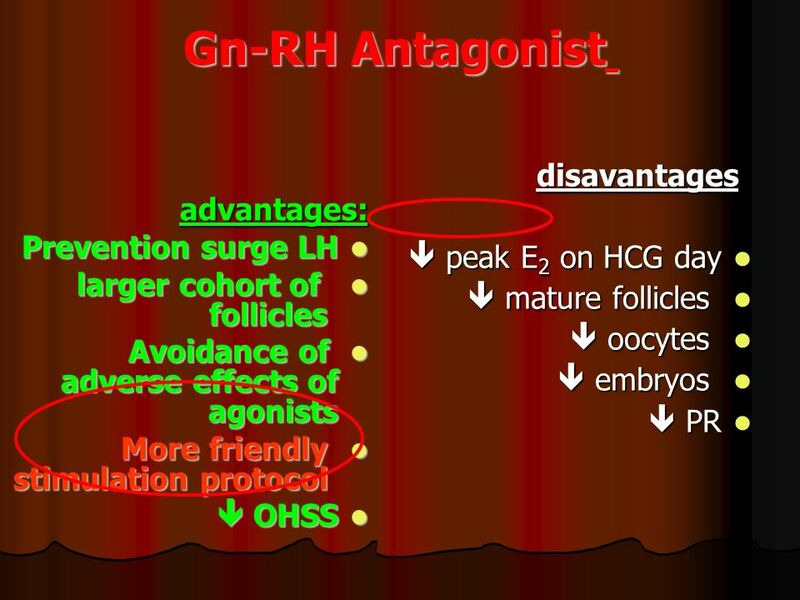 GnRH agonist instead of hCG to trigger ovulation in GnRH antagonist cycles Dec 10, 2004. 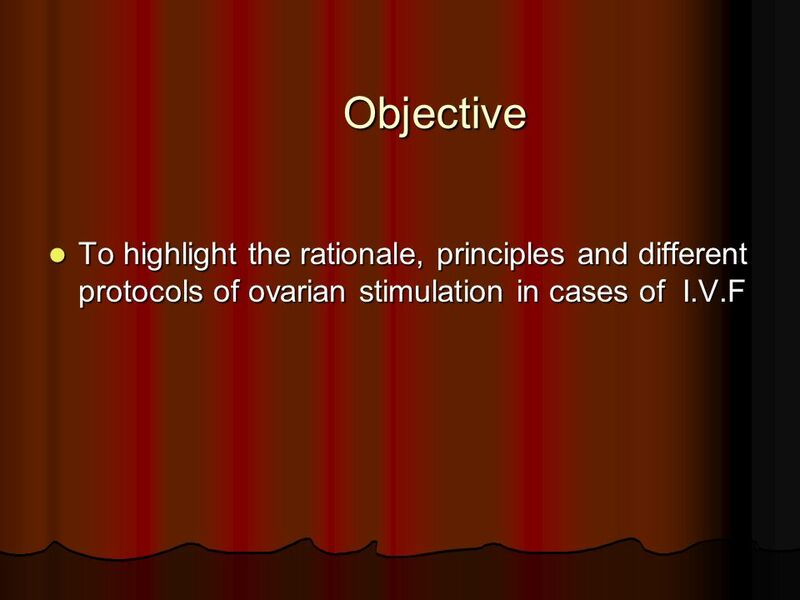 THE LEEDS CENTRE FOR REPRODUCTIVE MEDICINE SEACROFT HOSPITAL Version 1.1: January 2010. 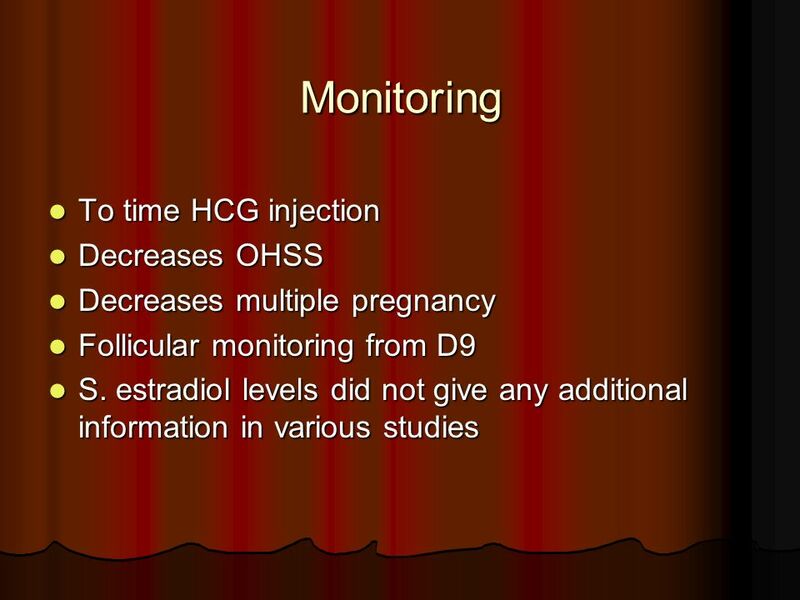 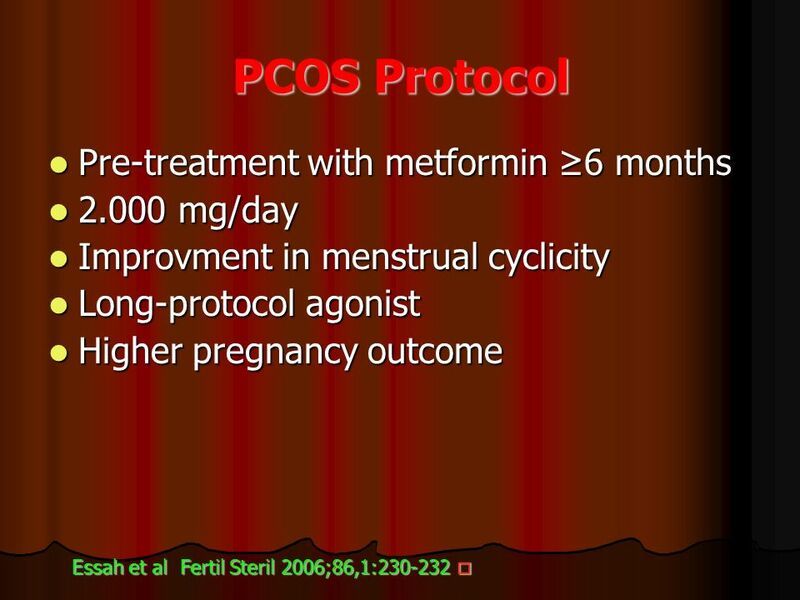 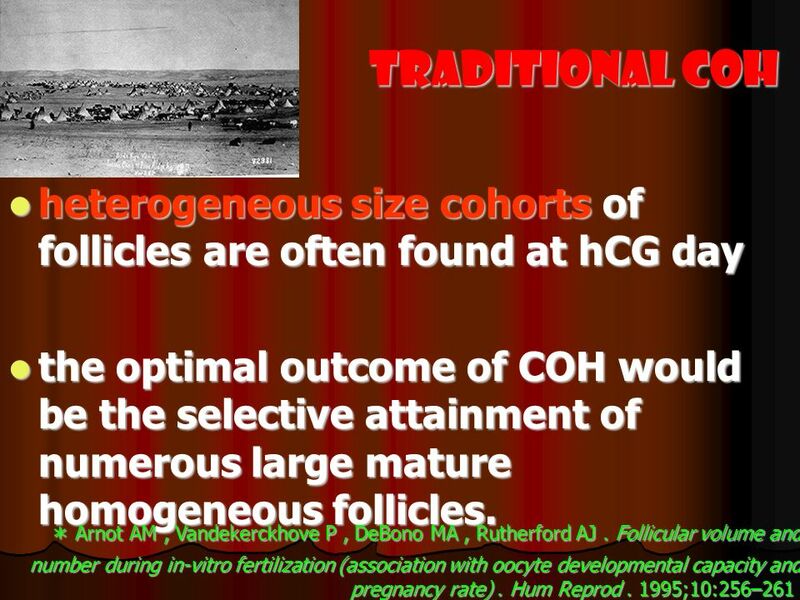 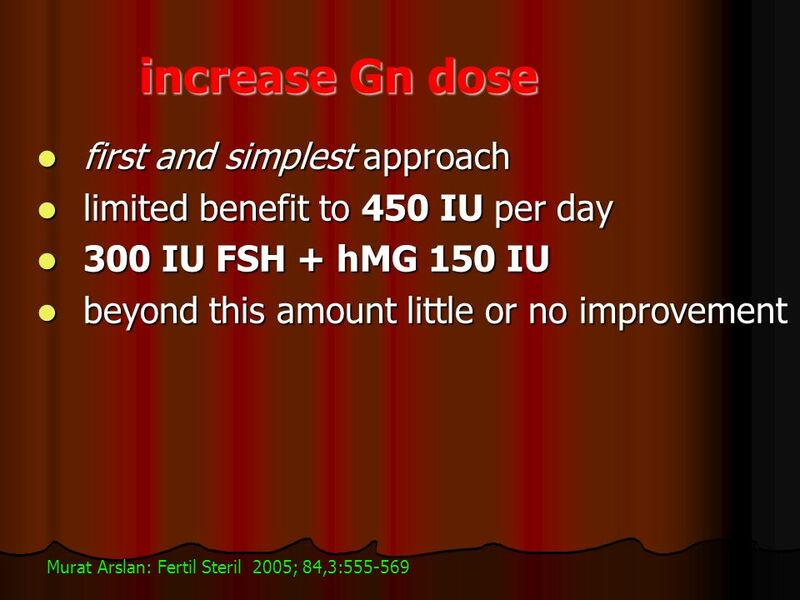 The use of hCG in microdose to support ovarian folliculgenesis Michel Abou Abdallah, M.D. 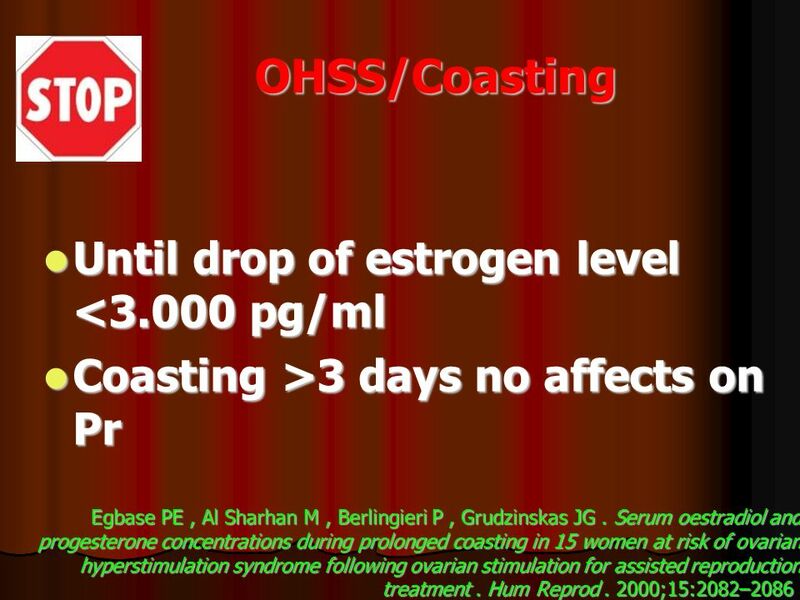 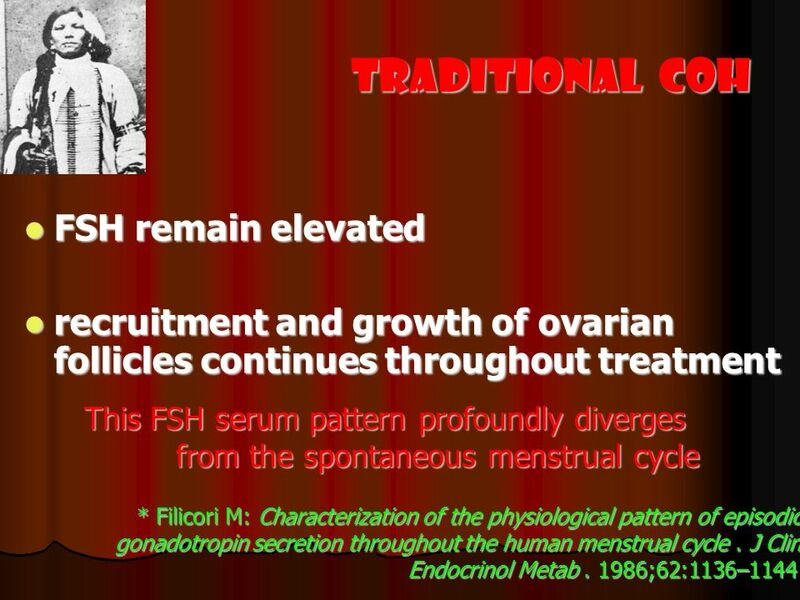  OHSS is a serious, potentially life- threatening, iatrogenic complication of “controlled” ovarian stimulation. 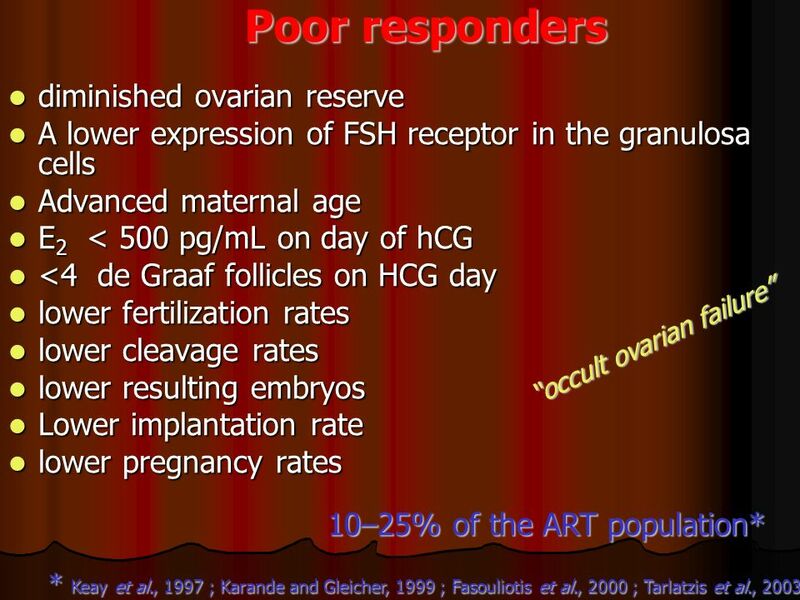  To optimize the ovarian response without. 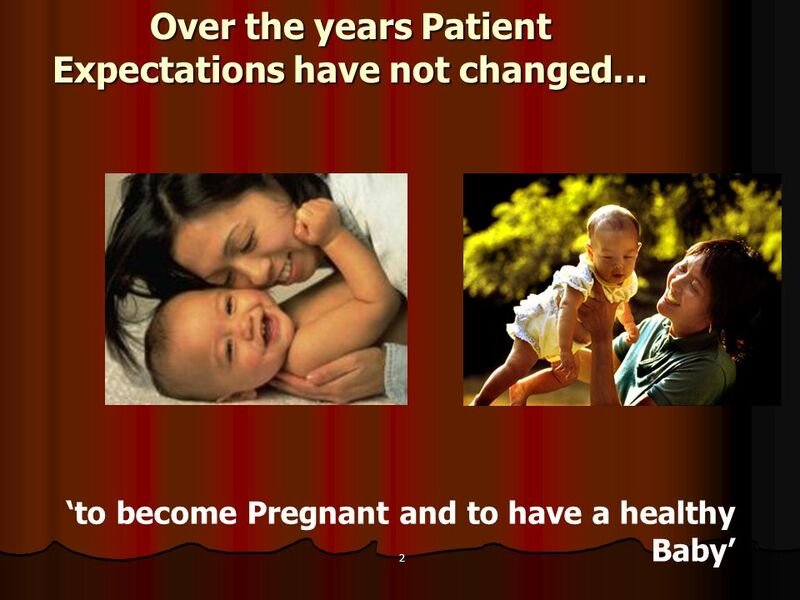 Shahar Kol, Maccabi Health Care Services Rambam Health Care Campus Technion, Israel Institute of Technology. 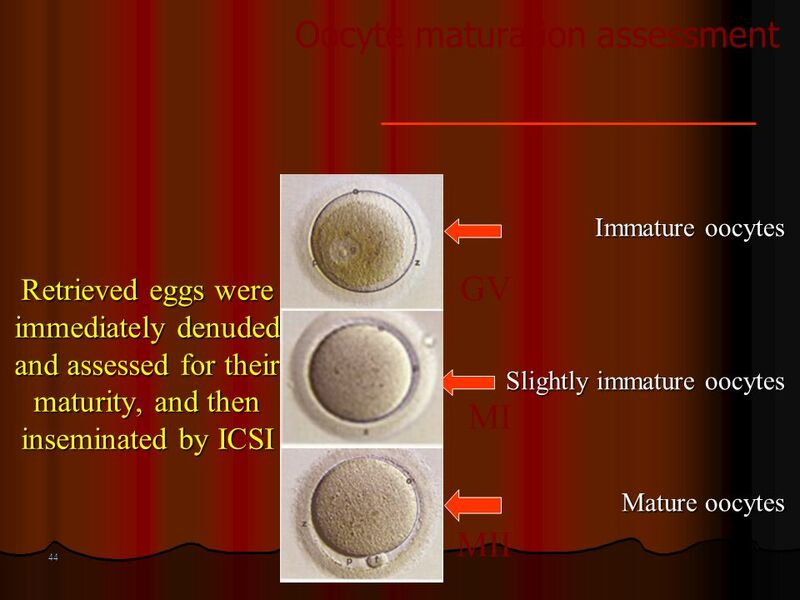 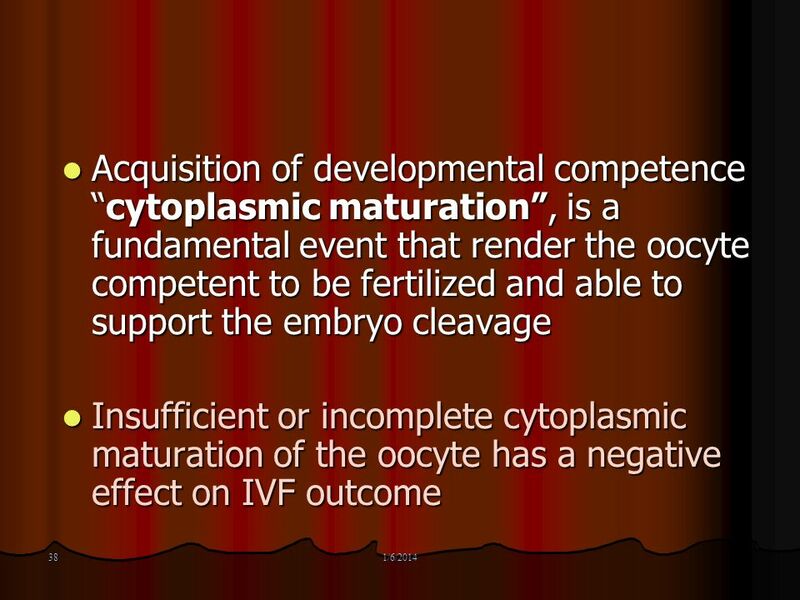 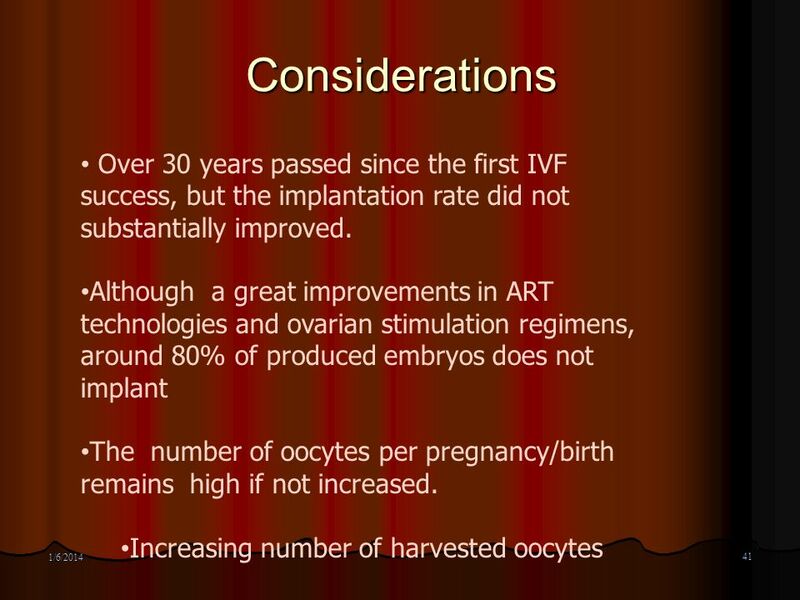 ART-IVF: the Long and Short of it Professor Ernest Hung Yu NG Department of Obstetrics & Gynaecology The University of Hong Kong. 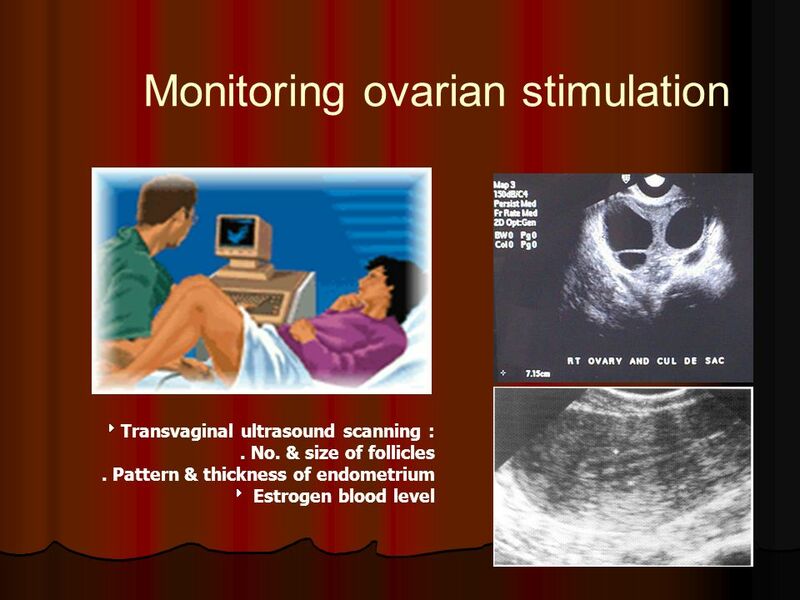 Minimal Monitoring of Ovulation Induction (OI) Is It Safe? 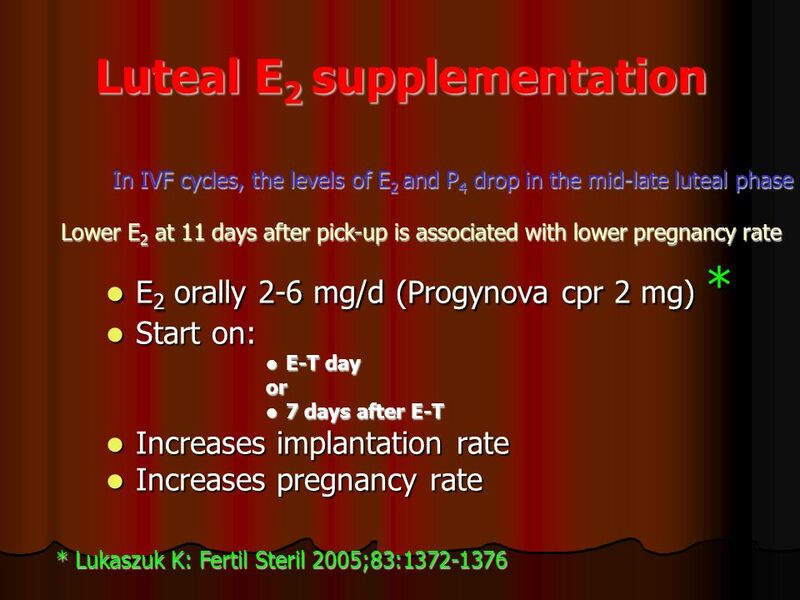 Mustafa Uğur Zekai Tahir Burak Women’s Health Education and Research Hospital, Ankara, Turkey. 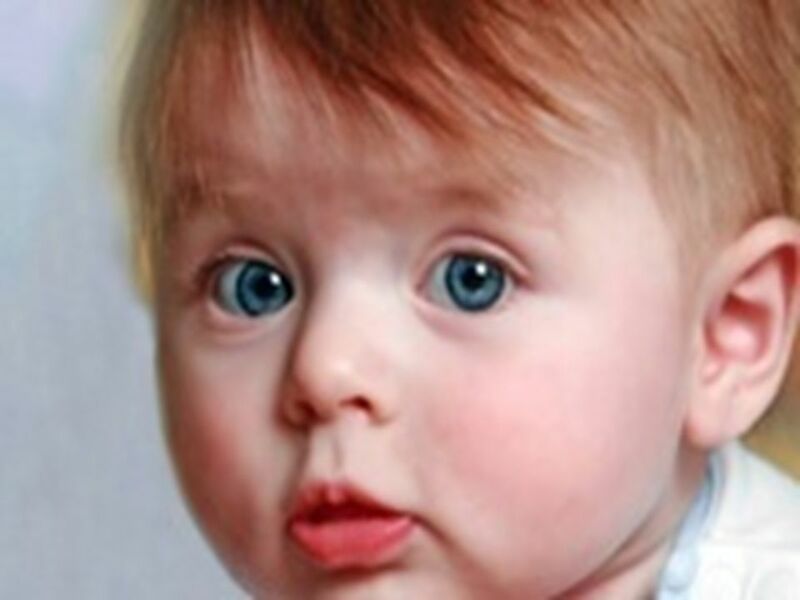 LIFE AFTER NEW IVF LEGISLATION IN TURKEY Hakan Ozornek, MD EUROFERTIL Istanbul. 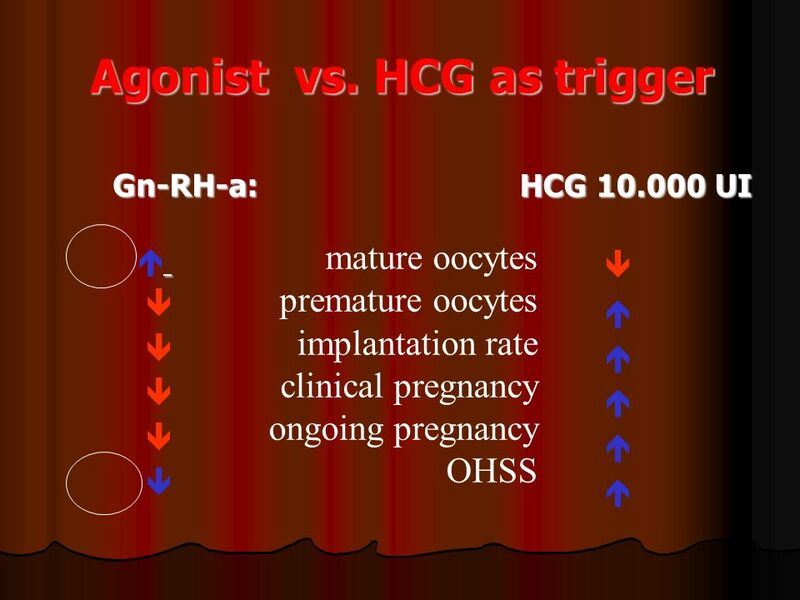 RECOMBINANT LH, RECOMBINANT HCG AND GNRH AGONIST TO TRIGGER OVULATION IN ANTAGONIST CYCLES: A CRITICAL EVALUATION SHAHAR KOL AUGUST 2014.